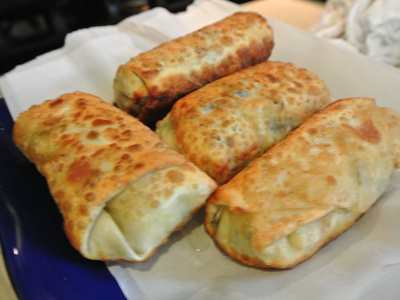 Egg rolls are known for being a fun finger food, an appetizer that tides you over until the main entree is served. 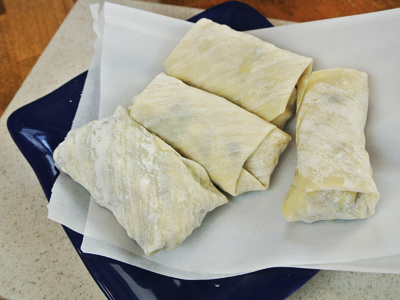 That might be the case at a restaurant but homemade egg rolls are a special treat. 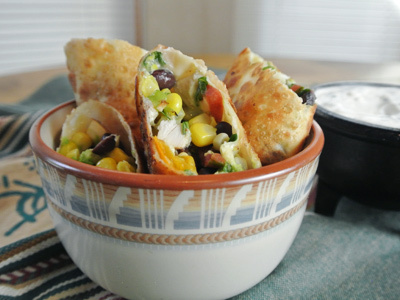 Southwest Egg Rolls are packed full of colorful veggies with grilled chicken and bound together with melting pepper jack cheese. And since they are packed with so much goodness, I serve them straight out of the fry pan hot and crispy onto plates where they are quickly devoured. 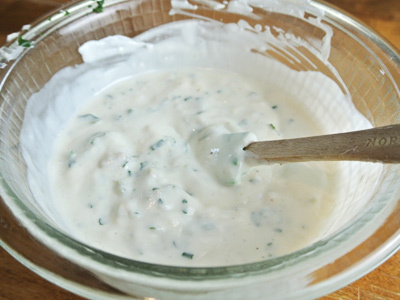 My favorite Flamethrower dipping sauce is made from buttermilk, sour cream, mayo, cider vinegar, dry mustard, garlic, chives, cilantro, salt and pepper. 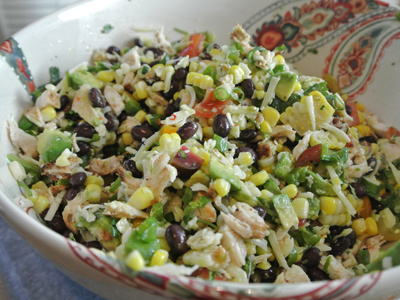 Combine all the ingredients into a small bowl and just for a little extra kick, I added a heaping tablespoon of Hatch green chile. Mix it all together and refrigerate to let all the flavors blend together. 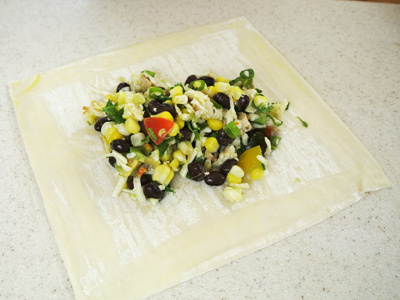 The filling for the egg rolls includes black beans, roasted corn, roasted jalapeno, grilled chicken, tomato, avocado, green onion, cilantro, garlic and lime juice. Also some pepper jack cheese which I left out of the photo but a must to bind it all together. I roasted the corn and jalapenos out on the grill ahead of time. The chicken was leftover chicken breast grilled the night before. Everything else was easy to chop or grate or juice. 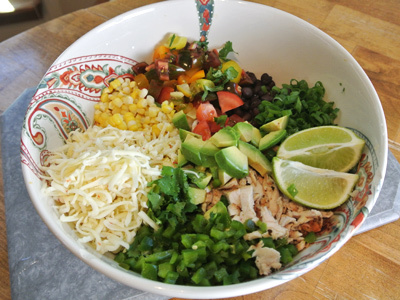 Just add it all to a large bowl and gently fold it together. When you are ready to assemble the egg rolls, make an egg wash by whisking together 1 egg and a tablespoon of water together. Brush the edges of your egg roll wrapper. 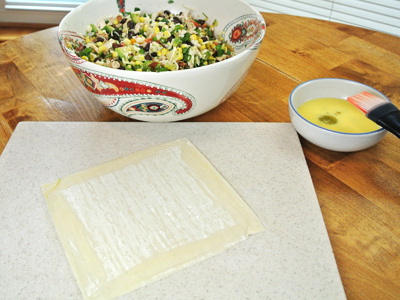 Place a heaping serving spoon full of egg roll mix onto the middle of the wrapper. Roll up from the bottom and fold the sides in like an envelope. Roll the rest of the way and seal. Continue on wrapping the rest. Heat a large skillet and pour enough canola oil to coat the bottom for pan frying. The oil needs to be nice and hot for best frying results. To test, stick a wooden spoon in the oil and when it begins to bubble it’s ready. Place the egg rolls in the hot oil. 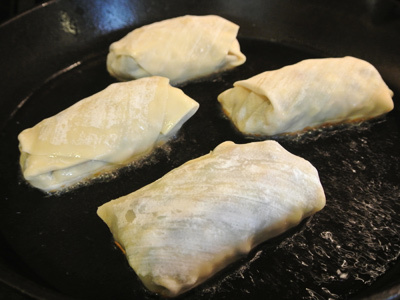 They brown quickly, use tongs to turn egg rolls to cook on all sides. Took maybe 3 minutes tops, frying and turning to get these browned so beautiful. Set them on a tray lined with paper towels to soak up any leftover grease. When you slice them in two you can see all those gorgeous veggies and grilled chicken. So yummy with a little flamethrower sauce! 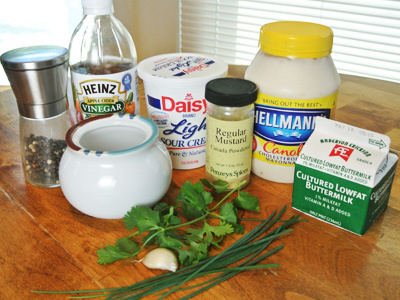 To make Flamethrower Sauce: Combine all ingredients together until well blended. Refrigerate until ready for use. To make Egg Rolls: Roast or grill chicken thighs or breast meat to make 2 cups of chopped chicken. Roast corn and jalapeno and prepare for filling. 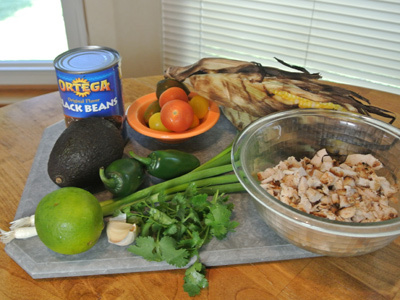 Combine cooked chicken, corn and jalapeno in a large bowl, Add the prepared beans, tomatoes, avocado, grated cheese, green onion, cilantro, garlic, and lime juice. 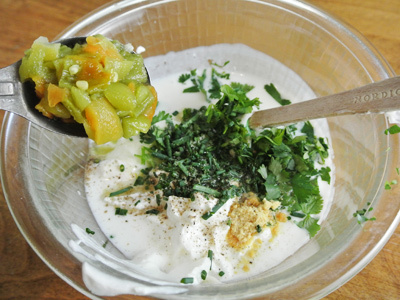 Fold ingredients together and salt to taste. Beat the egg and water to make an egg wash. Place an egg roll wrapper on a flat dry surface with one corner toward you like a diamond shape. Brush egg wash around the 4 edges of the wrapper. Spoon a big helping of the filling in the center of the wrapper and begin rolling the corner upward. 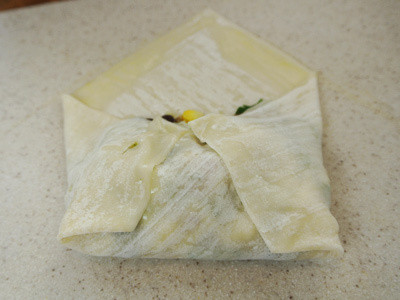 Wrap around the filling, fold in the side corners to seal the edges and continue rolling to seal the top edge. Pour 1/2 cup of canola oil in a skillet. Heat oil over high heat and pan fry egg rolls on all sides turning often until the egg rolls are browned and crisp on all sides. Drain on paper towels. If needed, add additional oil to the pan and continue frying the next batch. 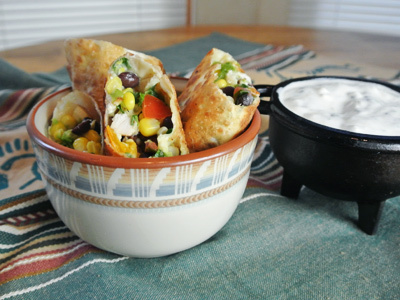 What a terrific idea to create egg rolls with a southwestern taste…they look great. 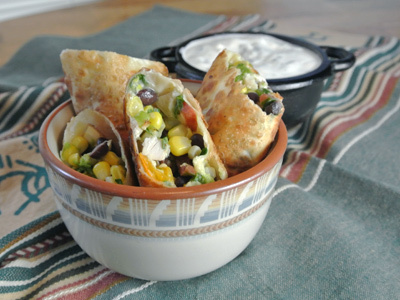 Thanks, I’ve always wanted to tweak my black bean and corn salsa recipe to make into an egg roll.